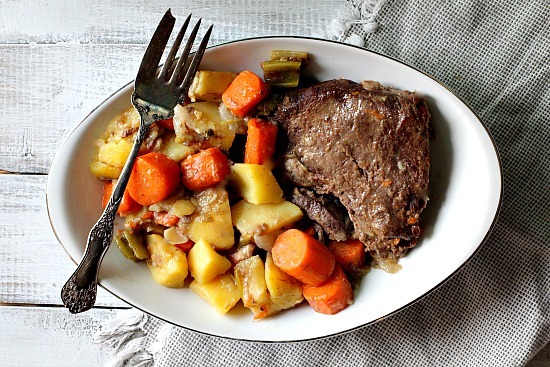 This Mexican Pot Roast Recipe is easy and full of earthy flavors. Your family will love this “just right spicy” version. Take that Sunday Pot Roast South of The Border. Before we get to this Mexican Pot Roast recipe, let’s talk about a couple of Mexican food staples. 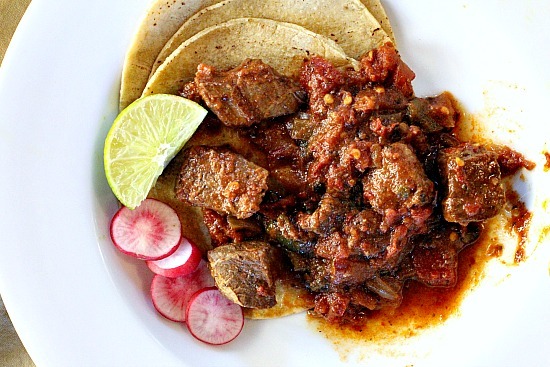 Have you ever made a Mexican red sauce using guajillo peppers? A Mexican cuisine staple, the guajillo pepper has gained popularity in my kitchen over the years. This sweet and smoky pepper, the “Holy Trinity” of Mexican chilies can be used for a variety of sauces in Mexican cuisine. You can find guajillos in the Mexican aisle of the grocery store, dried and hanging in clear plastic bags. All you need to do is soak them and let your food processor do the rest. The result is a beautiful, thick, earthy red gravy. You’ll find yourself grabbing for a bag on a regular basis. And what’s up with sliced radishes on Mexican food? Sliced radishes are used as a garnish on dishes such as enchiladas, posole. They are visually striking and offer a bright, fresh and slightly bitter contrast to the richness of any Mexican sauce. I’ve watched some people push them aside, but you really should try them with a bite of your favorite Mexican dish. No? Then just eat them separately with a sprinkle of fresh lime juice and a dash of salt. Now that we’ve got all of that out of the way, let’s make this Mexican pot roast recipe. Start with the red sauce: just toast Guajillo peppers in a dry non-stick skillet until starting to brown and aromatic. Then cover with just enough water to immerse the chiles and let them soak for 25-ish minutes. Remove tops and seeds from pepper and place water and peppers in a food processor and blend until smooth. Add spices, some tomatoes and roasted poblano peppers and your Mexican Pot Roast is ready for a slow cook in the oven. The aromas that fill your house will intoxicate. To serve just slice some radishes, cut up some limes and warm those corn tortillas. You’re ready for a Mexican feast. Enjoy! I hope you give this Mexican Pot Roast recipe a try, and if you do, please come back and give the recipe a star rating and leave a comment about your experience. And if you have a favorite version of Mexican Pot Roast, let me know, I’d love to give it a try. This Mexican Pot Roast Recipe is easy and full of earthy flavors. Your family will love this "just right spicy" version. Take that Sunday Pot Roast South of The Border. Cut roast into large chunks, remove any large chunks of fat. Heat a large skillet over medium high heat on stove top. Salt and pepper the chunks of beef and brown in skillet. Turning once. Remove beef and place in the bottom of a Dutch oven. Heat a non-stick skillet over medium high heat. When hot add dried peppers and toast on each side. About 5 minutes per side. Turn off heat and add about 1 cup of water, just enough to submerge peppers. Let the peppers soak for 25 minutes. When the chiles are soaked, cut the tops off the chiles and remove seeds. Place the soaking water and the chiles in a food processor and blend until smooth. Add garlic cloves, oregano, cinnamon and and blend. 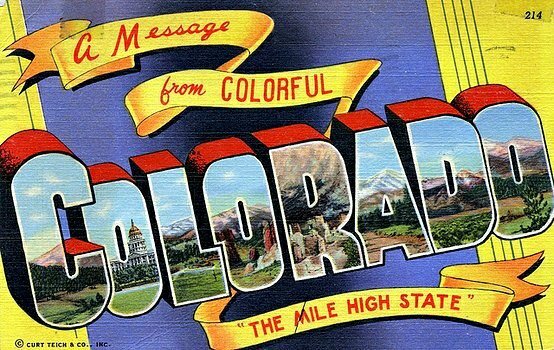 You should have a thick red sauce that resembles the thickness of catsup. If the mixture is too thick, add a little water. Pour this mixture over the beef in the Dutch oven. Add the undrained tomatoes and the chopped poblanos. Cook for 3 hours or until beef is fall apart tender. Check the roast after about an hour and a half and make sure the liquid isn't gone. That depends on the pan you're using. Add about a cup more water if dry. Serve over warmed corn tortillas. Garnish suggestions: radish, limes and avocado. Looks delicious LA. 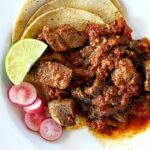 I recently made an Italian pot roast and now believe my next one should be Mexican – I’ll try to figure out how to make the red sauce from all of that pepper powder we’ve brought home from each trip out there. I’m one of those who push my sliced radishes aside, he he. 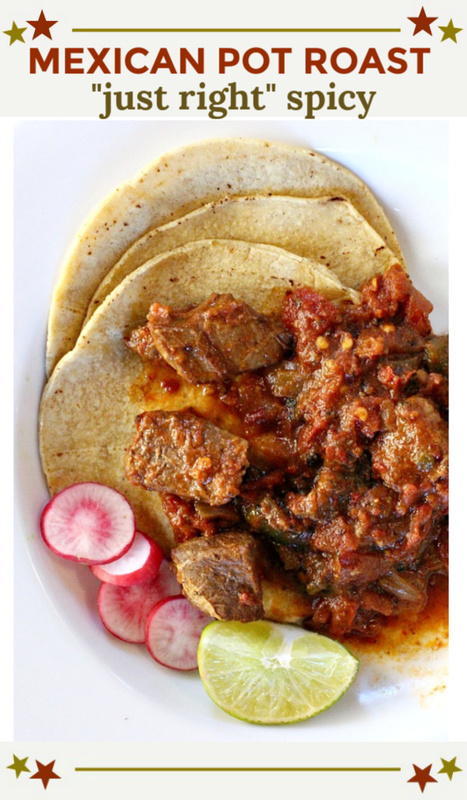 Raw radishes some how is not for me:) But, this pot roast with all those chillies, oh my…. I’m drooling right now! Thank you Maria. You really should try a bite of raw radish with Mexican food. Mmmm, big flavor! This looks terrific — exactly the sort of dish I like. I sometimes do a quick pickle of radishes — they’re a nice garnish. This looks great — thanks. Yumm, my kind of dish! I love anything with chiles in it. Yes ma’am! A former editor of mine used to bring a dish similar to this to our occasional potlucks. It was fabulous. (Admittedly, your recipe looks like it offers up a deeper flavor.) Keep’em coming, girl! I’d like to hear more about your editor’s version. Any vegetables? I’ve got guajillo peppers in my pantry and your pot roast is calling my name. I agree with you about the radishes, I think they make a nice accompaniment. Thanks Karen. Those guajillo peppers are a permanent resident in our pantry. Radishes are always so pretty on a plate, I’m afraid that I am the person that enjoys them separately, will try them together next time. Love all the flavors going on here, another great dish Lea Ann. Love this recipe and looks so delicious! 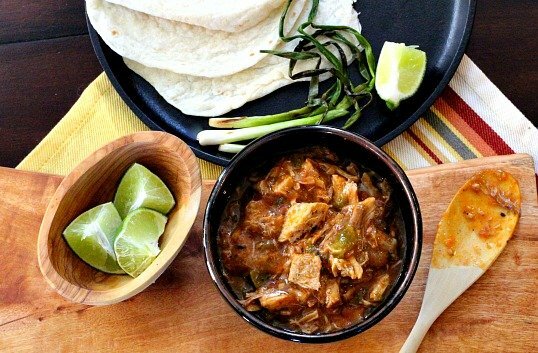 Mexican is my favorite cuisine so will have to try your recipe for next week’s Taco Tuesday! WOOOOOHOOOOO! Thanks for stopping in Karrie. Mexican is our favorite too. I LOVE pot roast. This sounds amazing. I love the idea of Guillio peppers! Never cooked with them before!